Covering more than 34,000 acres, Lake Dardanelle is filled with tournament-worthy bass. Championship tournament fisherman Shawn Gordon searches for the perfect spot on his hometown lake. For 2015 The Bass Federation (TBF) National Champion angler Shawn Gordon, there’s no body of water he’d rather call home than Lake Dardanelle, just outside his native Russellville. “There’s always something biting,” he says. “You can catch bass in the shallow areas year-round, and there are certain areas 15 to 20 feet deep that are good at different times.” Gordon, a 25-year veteran tournament fisherman, considers the lake to be some of the best bass fishing around, a sentiment echoed by the thousands of people who come to the lake every year to participate in the numerous bass tournaments held there and enjoy the variety of opportunities for family fun. 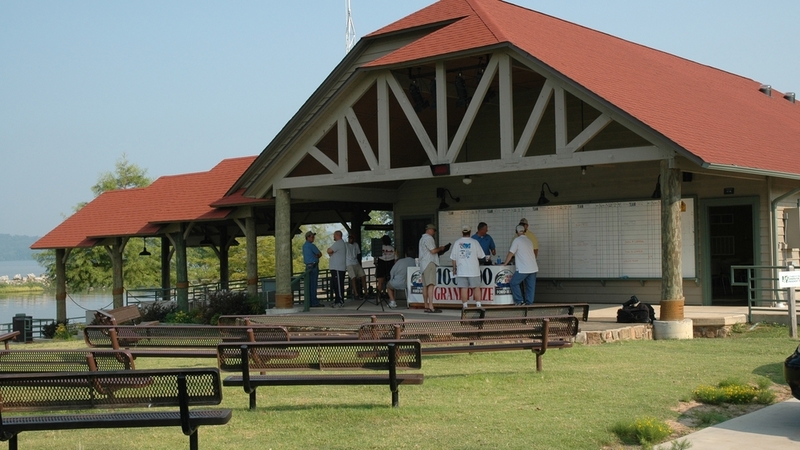 For Gordon, though, what sets Lake Dardanelle apart from other parks and lakes is the 1,861-square-foot weigh-in pavilion, a state-of-the-art tournament venue that opened in 2002. “It’s the first of its kind anywhere,” he says. “And there are a lot of places now copying it.” For a lake that hosts dozens of bass tournaments every year, such a facility gets its share of use. “It’s set up really well,” says Gordon. “The parking is made for guys with boats, and the boat ramp is four or five lanes wide. There’s a covered boardwalk down to the jetty, and that makes things easier.” Add to that the ability of tournament organizers to set up inside an area that can be locked overnight, and the result is a facility that allows tournaments to run smoothly week in and week out. Non-tournament anglers will find a lot to love about the area as well. Near the weigh-in facility, the park boasts a covered, barrier-free fishing pier with great views of the lake and nearby Mount Nebo. Gordon selects a bass jig from his bait rack. The visitors center at Lake Dardanelle State Park encompasses more than 10,000 square feet, and features a number of educational opportunities for visitors. 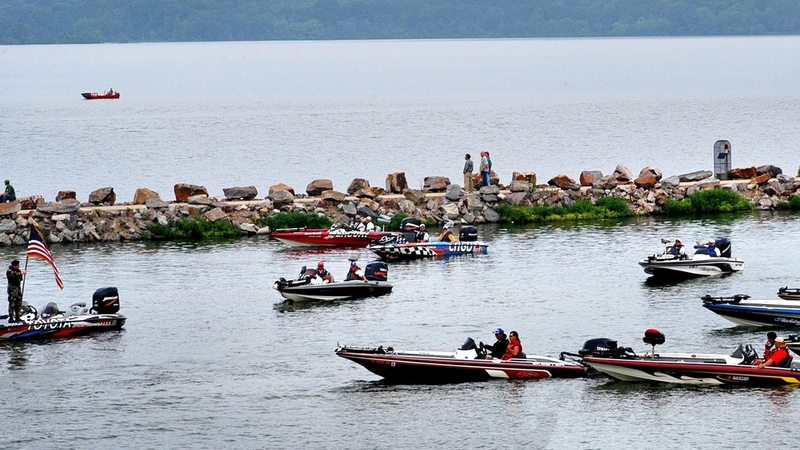 Lake Dardanelle plays hosts to numerous tournaments, including the Bassmaster Elite 50. The state-of-the-art tournament venue opened in 2002, and accommodates big events like the Big Bass Bonanza. Lake Dardanelle was formed in 1965 after the completion of the Dardanelle Dam across the Arkansas River. The project was part of the McClellan-Kerr navigation project to make the Arkansas River navigable by commercial vessels, but community and civic leaders in Russellville saw tremendous recreational potential in the 34,300-acre lake. The U.S. Army Corps of Engineers and the state of Arkansas agreed, and Lake Dardanelle State Park opened in 1966. The Arkansas Game and Fish Commission stocked the lake with striped bass in the 1970s, and the population has thrived ever since, making the lake a hot spot for great fishing. These days, the park stretches across two areas, a 163-acre section in Russellville and another 83 acres in Dardanelle. Visitors to the park can take advantage of camping available in both sections, including power and water hookups and bathroom facilities that include hot showers. And with Mount Nebo State Park only four miles away, folks in the mood to enjoy the lake while retiring to less rustic lodgings are very close to that park’s selection of cabins. The crown jewel of Lake Dardanelle State Park, however, is the 10,527-square-foot visitor center overlooking the lake, a facility that boasts numerous educational opportunities for visitors. Six aquariums are located at the center, each stocked with fish that make their home in the lake and Arkansas River, as well as the nearby Piney Creek and Illinois Bayou tributaries. A series of touch-screen kiosks provides an interactive experience that serves to teach visitors about the lake, water quality and the different wildlife that can be found in the area. In addition, the visitor center is also wired with cutting-edge fiber optics to connect with local schools and provide the park with public Internet access. In addition to providing such excellent opportunities for sport and relaxation, the influx of people that the lake brings in every year are a boon to the economy of Russellville and the surrounding areas. Tournament anglers from all over stay in area hotels, eat in area restaurants—and buy parts from one of the privately owned marinas located in the state park. Tourism is one of the state’s biggest industries, and a place like Lake Dardanelle where massive, hard-fighting bass can be caught regularly, is the sort of constant draw that keeps the surrounding areas vibrant while showcasing the beauty of The Natural State.